There’s no shortage of controversy over the flu vaccine – who should get it? when to get it? is it the right strain? does it even work? does it make you sick when you get the flu shot? Without getting into too much discussion regarding vaccines, I kind of hold the philosophy that if it’s not life-threatening I don’t often recommend a vaccine. When the seasons start to change I get our version of the flu shot ready…fire cider. When you wake up with a scratchy throat, beginning of sinus congestion, or a cough, take a shot of fire cider 3 times throughout the day for 2-3 days, or until the icky feeling goes away. 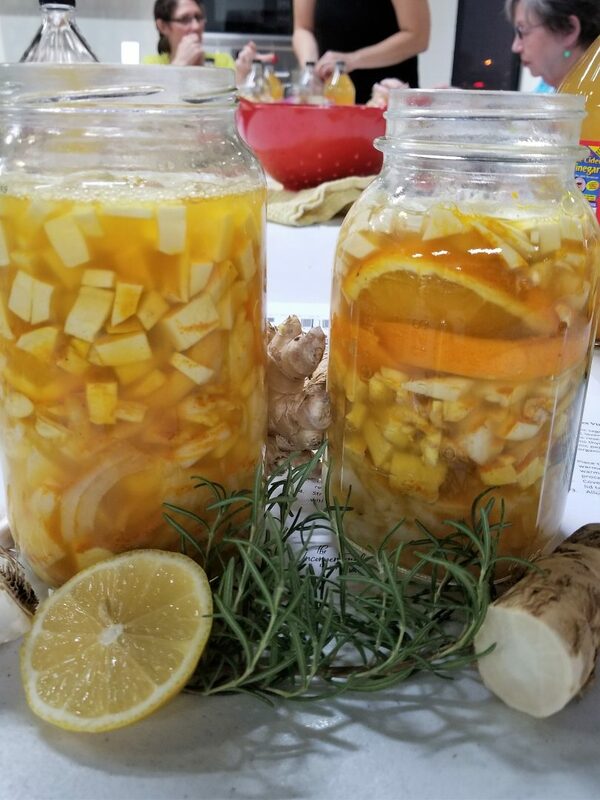 If you’ve been around someone, perhaps a sick child or caring for someone who has a cold or the flu, take a shot of fire cider 3 times throughout the day. While colds happen throughout the year the frequency increases as the days get shorter and we spend more time indoors during the fall and winter. The cider takes about a month to mature, so getting a head start on your potions is always a great idea. Place all ingredients except honey in a clean quart jar. Fill any leftover space with apple cider vinegar until there is 1 inch of air space remaining. Place a cap on the jar. If using a metal cap put wax paper or parchment paper to prevent the metal lid from corroding. Let the jar sit for 4-6 weeks, shaking daily, or as often as you remember. Strain the vinegar into a clean jar and add honey, starting with ¼ cup and increasing as needed to desired taste. There are many versions of this type of cider. If you can’t tolerate or prefer to not use an ingredient it is still worth making and using as needed. Have you ever tried fire cider for your cold & flu remedy?